ATLANTA — Taking advantage of the recent President's Day, Manheim Automotive Financial Services rolled out a new marketing initiative throughout the company's auctions that features larger-than-life replicas of past presidents. MAFS officials said this is the first national advertising campaign the company has launched in six years. Dealers and wholesale representatives should not be surprised if on one of their trips to auction, they spot George Washington, Abraham Lincoln or Andrew Jackson taking up space, boasting about MAFS's services. "Each president features a different product," said Kathy Decker, MAFS general manager. "They are six-foot, life-size metal stands with sandwich boards on them to help us advertise our products. "Our staff is very excited about our new initiative and the response has been tremendous," Decker explained in a recent interview with SubPrime Auto Finance News. "During our conference call to get out the word, we used some fun animation to let our staff know what we would be doing to advertise." For instance, Washington holds a sign that says, "Make Gold Work for You." As for Jackson, his sign reads, "45-Day Special is Ready to Work for You." Harkening back to the day when Uncle Sam posters were plastered throughout the country, featuring his famous catch-phrase, "I want you," MAFS officials hope their marketing initiative can help capture some of that nostalgia. "The overall theme of the program is that we want to show the dealers how we can make money work more for them. That's the common theme," said Jeff Bunch, vice president of sales and operations at MAFS. "These materials will be at 210 auctions throughout the country, including both independent and Manheim facilities," he continued. Decker added, "We have a lot of lines of credit available to dealers and we want to make it clear how easy it is to use our MAFS programs and make these programs work for them." In addition to the life-sized presidents, officials said they will also upload animated presidents onto the various sites and send out e-mails to dealers promoting the new campaign. The e-mails will be segmented into sections, with one grouping going to dealers who actively use the lines of credit, another category going to those who perhaps use it a bit and the last grouping goes to dealers who don't use MAFS programs. For instance, Decker said the e-mails going to dealers who actively use MAFS's line of products will thank them for their business. "This campaign is a commitment by us for the entire year," Bunch highlighted. "We will send constant e-mail follow-ups with customers about the presidents and also send snail mail. We'll feature them in different promotions throughout the year. For example, they will appear again in auctions for July 4, then go away for a little while and come back as the election time draws near." Each seasonal campaign with the presidents will have a slightly different focus, Bunch continued. "Basically, we just want to raise awareness and let dealers who use MAFS often know we appreciate their business and let dealers who don't use our services much know what we can do to help. We also want to get the auctions attention," Decker said. Late last year, MAFS announced the launch of a receivable financing program for dealers who offer a buy-here, pay-here program. "We have had tremendous response to this program, as we again are serving a niche of dealers that are important to Manheim but underserved by larger financial service providers," Decker explained. The new service primarily covers point-of-sale funding and was designed as a full-recourse program to complement the company's entire package of services, officials noted. MAFS boasts that its receivables funding will increase sales volumes, add to bottom lines, all while expanding portfolios. Offering a bit of history about MAFS, Decker said it was launched in 1994 to provide capital to independent dealers to increase their ability to purchase units at Manheim auctions. 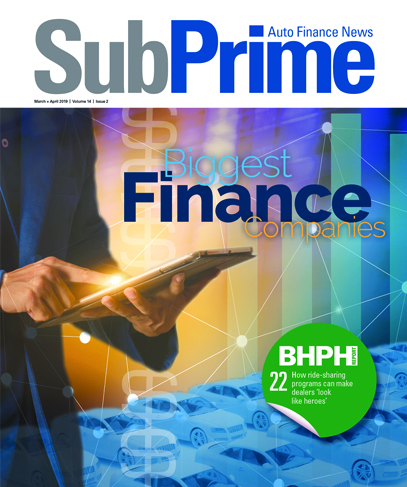 "The independent dealer market had been traditionally underserved by commercial banks, and Manheim's knowledge of these dealers' buying behaviors and the dealers' strong relationship with Manheim auctions made it natural for MAFS to establish lending relationships with this important dealer group," Decker told SubPrime Auto Finance News late last year. MAFS began with a 90-day Gold Card program, and since then has added the 45 Special, which is a shorter-term loan at lower-line amounts that requires fewer financial documents from the dealer, Decker said. "This program (45 Special), is especially helpful for dealers just getting into the business," she said. "We have also expanded the types of vehicles we will floor plan to include big trucks, recreational vehicles and motorcycles. The MAFS commercial financial services division offers loans for rental car inventories, working capital and receivables financings. "Dealers can also take advantage of the MAFS group insurance program to insure their vehicle inventories," Decker added. "Today, MAFS serves more than 15,000 dealers, providing $2 billion in available credit lines." For more information about MAFS services, visit www.usemafs.com, or call (877) USE-MAFS.